UK shoppers spent more online than anywhere else in Europe last year, accounting for almost a third of all European sales, research suggests. 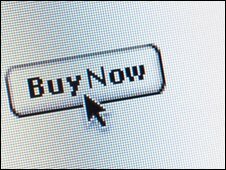 UK consumers spent £38bn online in 2009, or an average of £1,102 per shopper, according to the Centre for Retail Research (CRR). Online sales now account for almost 10% of total retail sales in the UK, the centre calculates. It added that internet shopping would continue to grow sharply this year. The centre foresees total online sales hitting £42.7bn in 2010. "This year is when we will really start to see online sales achieving a significant share of overall retail trade in the UK," said Bruce Fair, managing director of online shopping and price comparison site Kelkoo, which commissioned the research. He added that online shoppers were growing in confidence, with the proportion of them prepared to spend more than £1,000 or more on a single transaction rising from 12% in 2008 to 25% in 2009. The recession, from which the UK has only recently emerged, helped to explain the increase in online shopping, he argued. "In these hard times, it is no surprise that shoppers are turning to the internet rather than the High Street, especially when you consider that purchasing items online can result in savings of 20% or more," Mr Fair said. Germans were the next most prolific spenders online last year with a total spend of £29.7bn, while the French spent £22bn, the research indicates.